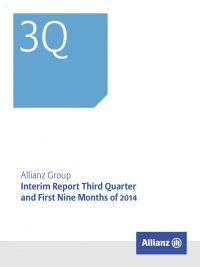 Interim Report Third Quarter and First Nine Months of 2014 Allianz Group 91 B Condensed Consolidated Interim Financial Statements 49 Consolidated Balance Sheets 50 Consolidated Income Statements 51 Consolidated Statements of Comprehensive Income 52 Consolidated Statements of Changes in Equity 53 Consolidated Statements of Cash Flows 55 Notes Income (expenses) from financial assets and liabilities designated at fair value through income (net) For the three months ended 30 September 2014, income and expenses from financial assets and liabilities designated at fair value through income (net) in the business segment Life/Health includes income from equity investments of € 6 mn (2013: € 80 mn) and income from debt investments of € 12 mn (2013: € 38 mn). Income from financial assets and liabilities carried at fair value through income (net) (Continued) € mn nine months ended 30 September Property- Casualty Life/Health Asset Management Corporate and Other Consolidation Group 2014 Income (expenses) from financial assets and liabilities held for trading (net) (231) (2,178) (1) (62) (2) (2,474) Income (expenses) from financial assets and liabilities designated at fair value through income (net) 2 161 3 5 (1) 169 Income (expenses) from financial liabilities for puttable equity instruments (net) – (94) – – – (94) Foreign currency gains and losses (net) 172 1,557 3 63 – 1,795 Total (58) (555) 5 6 (3) (604) 2013 Income (expenses) from financial assets and liabilities held for trading (net) (3) (685) 1 (4) 2 (689) Income (expenses) from financial assets and liabilities designated at fair value through income (net) 26 203 45 1 (1) 274 Income (expenses) from financial liabilities for puttable equity instruments (net) (19) (97) (37) – – (153) Foreign currency gains and losses (net) (58) (874) (1) 13 – (920) Total (54) (1,453) 8 10 1 (1,489) Foreign currency gains and losses (net) Foreign currency gains and losses are reported within income from financial assets and liabilities carried at fair value through income (net). These foreign currency gains and losses arise subsequent to initial recognition on all assets and liabilities denominated in a ­foreign currency that are monetary items and not measured at fair value through profit or loss. The ­Allianz Group uses freestanding derivatives, included in the line item income (expenses) from finan- cial assets and liabilities held for trading (net), to hedge against for- eign currency fluctuations. For these derivatives, expenses in the amount of € 1,567 mn (2013: income in the amount of € 442 mn) were recognized for the three months ended 30 September 2014.